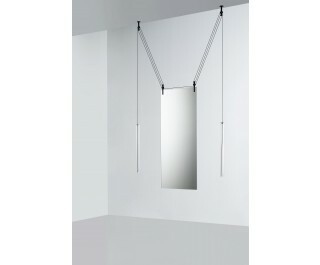 A double-faced mirror hanging from the ceiling available in three versions that, thanks to a system of counterweights, cables and pulleys, can be easily vertically positioned. The counterweights, that go up and down balancing the movement of the mirror, are cylinders in red, brown or neutral blown glass. The cables and pulleys are in black aluminium. Because of the double-faced feature, this mirror is perfect to be hung near a wall, but also in the middle of a location as dividing and/or screening element.